Multitec 06 cutter/Nipper/shear is a micro cutter with long handle and very convenient to shear wires in delicate hard to reach places. 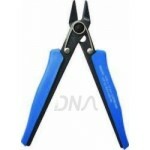 Micro Shears Cut wires from 0.8mm to 1.2 mm. The tool is made of alloy steel, which makes it tough. This is an excellent tool for TV technicians, wire-men, cable operators and hobbyists. Multitec 07 Nipper CutterH-1 FEET L-1/2 FEET W-200 GM Versatile tool for cutting copper and aluminiu..
MULTITEC 06-SS Stainless Steel Micro ShearStainless Steel Micro Shear Cut wires from 0.8 to 1.4mm. S..